I’ve been dreaming of New England. 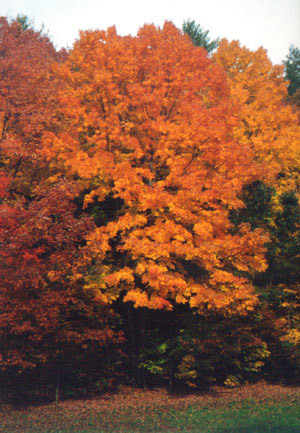 That picture perfect autumnal New England with red and gold leaves strewn across still green lawns. I’ve been feeling in my bones that chill of autumn that crisps an early morning and leaves dew on the driveway. It’s odd to wake from these dreams and see the solid, flat Midwestern landscape stretched out in front of me as I drive my expressway commute to the college. In those short stretches off the highway, I drive down a two lane highway and for a brief five minutes I see clumps of trees in grassy meadows and I’m reminded of New England. These New England memories are awakened, I think, by the beginning of the school year and the onset of autumn, which, despite the hot humid weather of Chicago, I can still feel coming. Underneath that 80 degree day there’s just the slightest hint of seasonal change. And the apples have come into the farmer’s market. All kinds of apples: Macoun, Jonathan, Gala, and Red Delicious. In the Midwest there are also hybrids I had not seen before: Jonalicious and Prairie Spy. Pumpkins, too, have arrived. Small, perfect, round pie pumpkins have come to sit alongside large ones perfect for jack o’lanterns. And the apple cider is sweet and fragrant. I was born and raised in New England and despite the many years in different states and countries, when October looms, I always still think of the country roads of New England. Even here in Chicago, which has its own picturesque version of autumn, I still remember New England. Here, the trees change color alongside the lake, the leaves contrast against the bright blue of the water and the sky. The lakeside parks are filled in autumn with dog owners in sweaters and dogs scattering leaves as they run. It is, perhaps, harder than one realizes to forget those beginning years of one’s life. Those tender years from birth to adulthood, spent in a town or a state that one did not choose. For better or worse, that place becomes the first image of home and we may spend the rest of our lives revising that picture of home. We may try to turn the memory of that one story ranch house into a picture of a three-story Victorian or an urban loft, but whether we like it or not, those first few memories of seasons are the most memorable. The memory of the leaves turning gold on the tree in our childhood backyard remains with us years after we have seen the leaves of other trees in England, France or the Midwest. The first jack o’ lantern carved from a grocery store pumpkin will be the memory we remember even after years of cutting faces into other pumpkins. So, I have been thinking of New England. Somewhere inside of me are the valleys of upstate New York, the blacktop of a lonely interstate and the flat fields of corn at the bottom of the valley. But my body is here. I am here. The prairie rolls ahead of me in grassy, golden waves, reminding me. The desert holds no real change in season, except for the fact that it might get more windy. Give me some woods and not this blasted desert. Again I revel at the thought that I am no longer in the swamps of Houston — especially during hurricane season. The leaves are just beginning to be touched with gold and red here, but it will be all too soon that glorious riot of color.